Description In this game there are 7 piles of tableau cards, each contains 7 cards and the first 3 cards of the first 4 piles are covered, the remaining 3 cards of the deck are put aside as the stock cards. 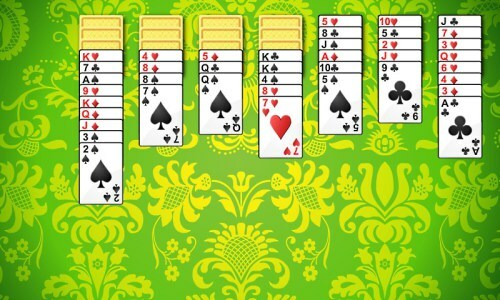 The object of the game is to arrange the tableau cards so that there are 4 columns of cards from K to A with the same suit. Each time, you can move any card from any tableau pile but when you move, the cards on top of the moving card must move together as a pile. You can put the pile on a tableau pile if the last cards of the tableau pile is one point higher than the moving card and is of the same suit. When a tableau pile is empty, you can put a king on it. At any time of the game, you can click the stock cards to deal them to each of the first 3 tableau piles. The faster you finish the game, the higher the score.